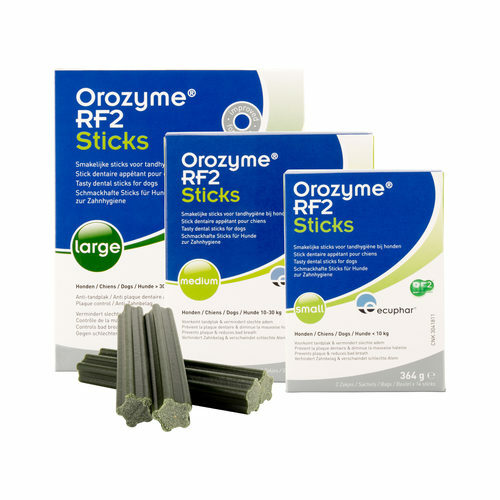 Orozyme RF2 Sticks help to prevent plaque and bad breath. The sticks are made up of vegetables and contain the active ingredient RF2, a unique active formula that significantly reduces formation of plaque (biofilm) on teeth and acts against bad breath in dogs. When a dog's teeth are neglected, it may lose teeth and even molars. What is even worse is that dental problems may affect your dog's health. Dental plaque is a barely visible film that is constantly forming on your dog's teeth. It is made up of food, mucous and bacteria. If it is not removed, the plaque becomes tartar. You can help remove plaque yourself, but tartar can only be removed by your veterinarian. The composition, structure and shape of the Orozyme RF2 Sticks provide a mechanical abrasive effect, which cleans the teeth down to the gum line. Regular chewing on the Sticks counteracts the formation of a biofilm layer (plaque) and tackles bad breath in dogs. The sticks contain an acceptable number of calories: Small 35 kcal, Medium 63 kcal and Large 90 kcal. Orozyme RF2 ensures that a dog's own bacterial oral flora is maintained, but that the bacteria are no longer able to form plaque. Because the natural balance of the oral flora does not change and low concentrations of RF2 are sufficient, the formation of plaque is constantly prevented. Small: for small dogs weighing less than 10 kg. Medium: for medium dogs between 10 and 30 kg. Large: for large dogs weighing over 30 kg. The Sticks can be given every day in order to achieve maximum effect. Vegetable products, cereals, meat and meat derivatives, minerals, oils and fats, RF2 Rheum palmatum radix pulvis. Analytical guarantees: Rice, Rheum Palmatum(source of RF2), minerals (phosphorus), preservative, flavourings and antioxidants, crude protein: 6.5%, crude fat: 1.5%, crude ash: 3.5%, crude fibre: 1.5%, moisture: 14.0%. Also available at Vetsend.co.uk, Orozyme RF2 Aquadyl. This product can be dissolved in drinking water and has the same effect as the Orozyme RF2 Sticks. Have you used Orozyme RF2 Sticks before? Let us know what you think about this product.